Still using a manual toothbrush? Really? Come on, now. It’s the year 2014 (soon to be 2015!). You need to get with the times and splurge for an electric toothbrush. Specifically, a Sonicare electric toothbrush, which works wonders for your teeth and gums. After all, it is the #1 recommended power toothbrush brand recommended by dental professionals. The brush head on the Sonicare Essence removes up to two times the amount of plaque than a manual toothbrush. Philips, the manufacturer of the Sonicare, even thought about those who suffer from sensitive teeth and made a specific brush head designed to be gentle on the teeth and gums. Flawless. Is that how you wake up? While we can’t all be Beyoncé, we can certainly make sure our teeth are flawless. 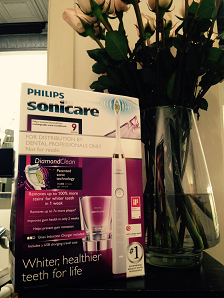 The Sonicare DiamondClean is the next step up from the Essence. It comes with five modes for crying out loud! Polish and white modes? Count me in. It gently lifts stains, thus brightening teeth. High density diamond shaped bristles help get into the nooks and crannies that a manual brush can’t reach. Probably the coolest Sonicare device to be developed to date is the AirFloss. Sounds like a new Nike shoe, right?! But lo and behold, it is a handy little gadget that shoots a burst of air and water in between your teeth to help remove plaque buildup and any food particles lingering about. The Sonicare AirFloss removes almost 100% more plaque than when brushing with a manual toothbrush. There is a built-in reservoir in the body of the AirFloss that you fill with water before use. After pushing the power button to turn on the device, simply position the guidance tip of the AirFloss at the point where your gum line meets the space in between two teeth and press the activation button. A gentle bust of air and water will spout from the guidance tip, through your teeth and into your mouth. Always make sure the AirFloss is positioned on the outside of your teeth facing the interior of your mouth. I suppose you could try it from the inside and face the tip outward, but that would be extremely awkward. Once fully charged, the Sonicare AirFloss can last two weeks before needing to be charged again. Think you might overdo it a little? No worries. The AirFloss has an automatic shut-off mechanism that activates after four minutes of use. Call Dr. Jessica T. Emery at Sugar Fix Dental Loft today with any questions about Sonicare electric toothbrushes such as the Essence, DiamondClean and the AirFloss. This Christmas, ask for the DiamondClean or AirFloss (why not both?) and shine bright like a diamond.